The 2015 v2 release includes two new controls with the same features for all platforms. 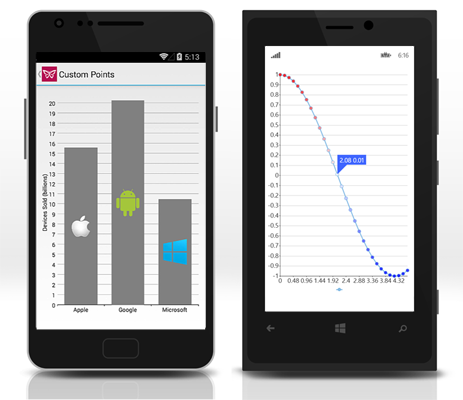 The Xuni FlexGrid control brings a spreadsheet-like experience to your mobile apps, with intuitive touch gestures and quick cell editing capabilities. 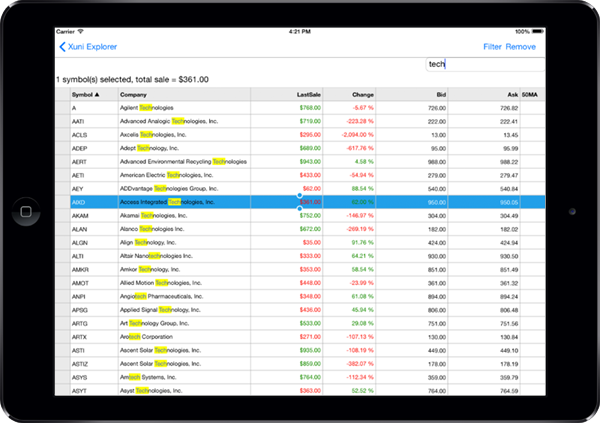 FlexGrid is a datagrid control that allows you to display tabular data across columns and down rows. 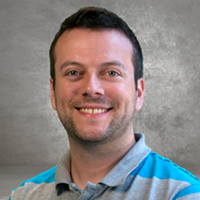 What makes it more useful than a ListView is that it offers specialized cell selection and editing capabilities, in addition to built-in sorting, grouping and filtering thanks to our CollectionView class. Learn more about FlexGrid and CollectionView. 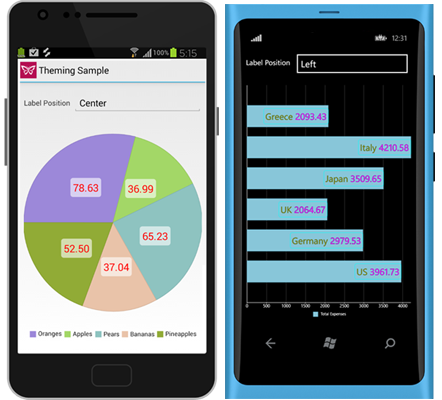 The FlexChart and FlexPie controls are completely new for iOS and Android developers. 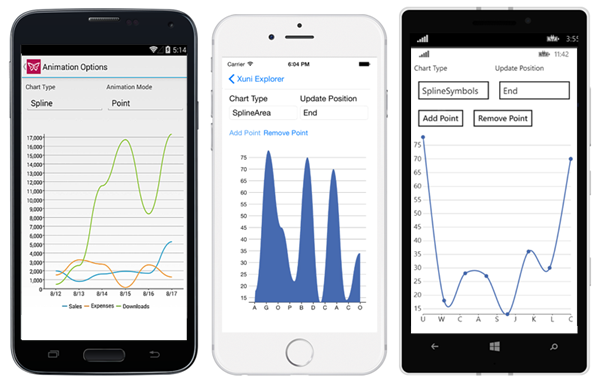 For Xamarin.Forms developers, several major new features have been added in this release including support for multiple axes, spline chart types, data labels, custom plot elements, responsive legends, update animation and image export. 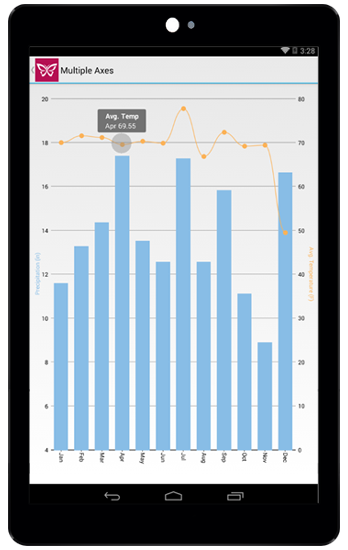 Multiple Axes – display any number of auxiliary Y axes to make composite charts more impactful. Spline Chart Types – three new spline chart types to choose from: spline, spline with symbols and spline Area. Spline charts are basically smoothed line charts. Data Labels – create and customize your own static data labels to display on each plot element. You can customize the content as well as the position by just setting a few properties. This feature is also supported in FlexPie. Custom Plot Elements – customize the plot elements in more ways than one. You can apply conditional formatting by styling specific plot elements to show a trend. Or you can completely customize the appearance of the plot elements to show your own design. Responsive Legends - the FlexChart and FlexPie legends now position themselves responsively by default. This means if the page is landscape the legend positions on the right. If the page is in portrait view the legend positions itself on the bottom. For charts, this is helpful because it allows the visualization to efficiently use the available space. This feature is enabled by setting the Legend.Position = Auto. Of course, you can override it by setting any specific position. Update Animation – get built-in animation effects on the plot elements when the data changes. This feature not only brings life to your data visualization, but it's also useful to emphasize trends. Just like the load animation, you can configure the duration and easing of the animation by setting the UpdateAnimation properties. Image Export – you can easily obtain the image of the FlexChart control and further save it, share it or do whatever is imaginable with an image. This feature is actually enabled in every Xuni control including FlexGrid and the gauges. To export the image of the control you just call the GetImage method and then use standard platform techniques to manipulate the bytes. 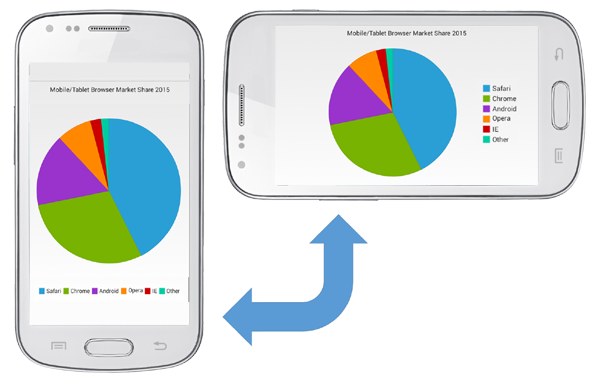 Learn more and see all features for FlexChart and FlexPie. To see how to implement the new features, check out the online documentation.